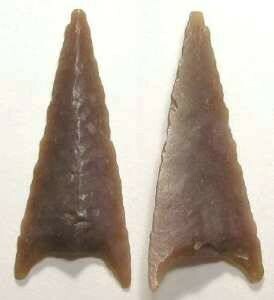 North African flint arrow or atlatl point. Mesolithic period, ca. 4000 to 10,000 BC. Size : 37.8 x 15.4 x 3.8 mm. Origin : North West Africa. All though commonly called arrow points, it is probable these points were use mounted on the small spears thrown with an atlatl (spear thrower). Similar points are found across North Africa but this point came from a group found in the Western part along the Morrocan and Algerian border.